This course provides the practicing nurse with theory and skills needed to successfully conduct a comprehensive health history and head-to-toe assessment on persons throughout the lifespan, with emphasis on building knowledge and skill in data acquisition. A course focusing on the transition from technical to professional nursing. It addresses the scope and standards of professional nursing practice, the theoretical basis of practice, the ethical and legal components of practice, information management and application of patient care technology, and inter professional communication and collaboration for improving patient health outcomes. A course designed to enhance knowledge of the relationship between health care policy and professional nursing. This course will explore the broader context of health care including how patient care services are organized and financed, and how reimbursement is structured. Regulatory agencies define boundaries of nursing practice and students need to understand the scope and role of these agencies. There will be discussion of how health care issues are identified, how health care policy is both developed and changed, and how that process can be influenced through the efforts of nurses, other health care professionals, and lay and special advocacy groups. 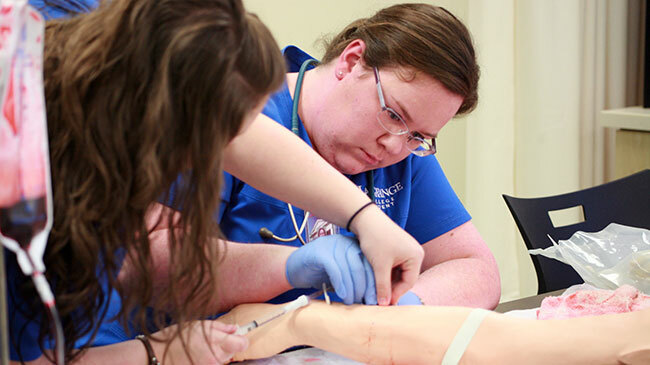 Students are introduced to theories of nursing with an emphasis on developing an understanding of how they are used in evidence-based practice. The purpose of this course is to examine pharmacotherapeutic agents used in the treatment of illness and the promotion, maintenance and restoration of wellness in diverse individuals across the lifespan. It focuses on drug classification, concepts and principles of pharmacology with special consideration for the nursing role in developing a comprehensive approach to the clinical application of drug therapy through the use of the nursing process. Nursing implications relative to the utilization of drug therapy are examined. Safety and legal implications of drug administration are discussed. A course that focuses on professional nursing practice that is grounded in the translation of current evidence into practice. It is designed to assist students in developing a sense of inquiry, including the research process, designs, sampling strategies, data and analysis methods, protection of human subjects and patients, and the dissemination of nursing knowledge to improve patient outcomes. This course is directed toward the nursing care of aggregate systems within a community. Topics include community health nursing roles and basic concepts of community health. The course addresses the implementation of population-focused care through the nursing process, collaboration, and interdisciplinary skills. It includes the importance of health promotion, along with disease and injury prevention, throughout the lifespan and the assistance of individuals, families, groups, communities, and populations to prepare for and minimize consequences of emergencies, including mass casualty disasters, infectious and communicable disease, and bioterrorism. The course includes a practicum where the student integrates concepts from theory within a health care environment. Theory and practicum are designed to build on the student’s professional experience and to prepare him or her for population-focused practice in community public health settings where he or she can meet the health needs of the community. The practicum is overseen by the instructor and developed and designed in collaboration with the student. This course focuses on nursing leadership including developing and refining knowledge, skills, and attitudes in working within organizational and community arenas. It also focuses on the actual provision of care and/or supervising care provided by other licensed and non-licensed assistive personnel. This course examines nursing leadership and management through use of a systems approach with a focus on quality and safety of client care. Leadership models, behavior, and strategic planning will be discussed at various organizational levels. Focus is on use of outcome data to evaluate nursing care delivery systems and to proposed quality improvement initiatives. The examination of current practice issues, social justice/diversity issues, and the process of personal/professional development will be included. Leadership and management roles assumed in clinical practice and increasing autonomy in patient care are guided through preceptorial experiences. This course provides an introduction to the concepts and issues related to global health promotion. Special consideration will be given to infectious and communicable diseases, environmental issues, nutrition, and vulnerable populations. International health organizations and governmental policy will also be analyzed. Informatics in healthcare will include how computer-based information systems are designed, developed, and implemented. With innovations in healthcare technology, unique opportunities and challenges for the end-user will be considered and carefully addressed. This course will provide students with a thorough understanding of confidentiality issues surrounding information management. Additionally, participants will gain an understanding of the impact information management systems have on the healthcare team, delivery of care, efficiency and productivity, patient safety, and health outcomes.